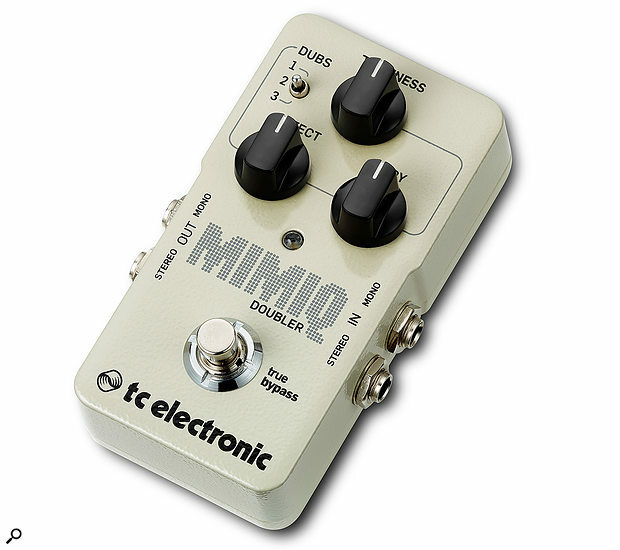 Designed to slot into TC Electronic’s ever-growing series of pedals, the Mimiq Doubler is essentially a real-time digital double-tracking emulator that’s able to add one, two, or three ‘cloned’ parts to the original dry signal, but with each part varying slightly in tuning, timing and attack, with the aim of closely recreating the sound of a genuinely overdubbed performance. Apparently, the designers introduced a dynamic element into the pitch detuning and timing, to make the effect more realistic than the usual ‘fixed delay and fixed detune’ approach — although naturally, TC won’t reveal precise details of their recipe! The pedal, which features true bypass and an ‘effect active’ LED, runs from a standard 9V battery or optional Boss-compatible PSU adaptor. As current consumption is around 100mA, though, PSU use is recommended. A mini USB port is located on the back of the pedal purely to accommodate software updates (although TC’s Toneprint system isn’t available with this pedal). 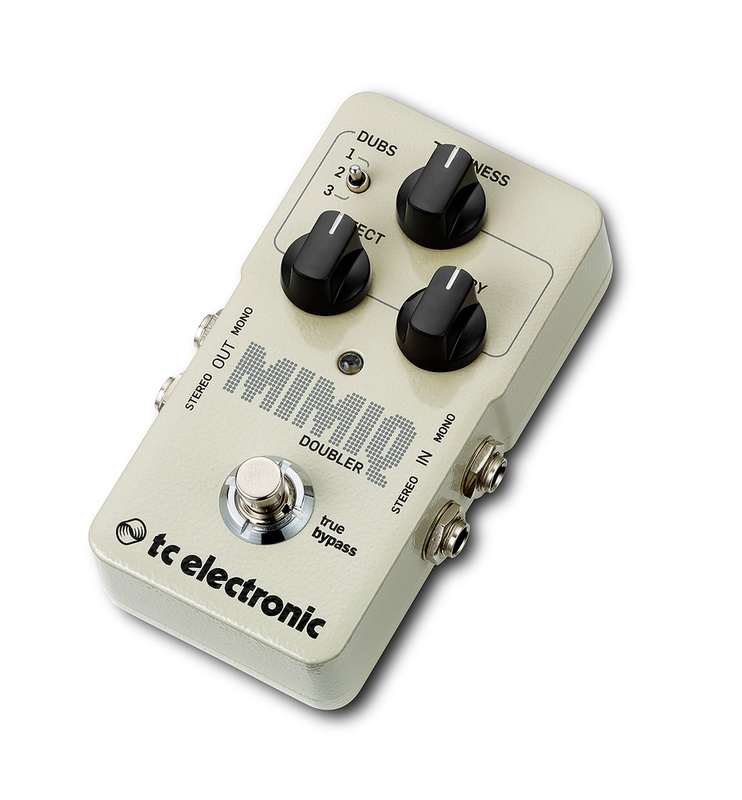 Housed in the same rugged, but compact pedal as TC’s mainstream pedals, the Mimiq Doubler has dual inputs and outputs and so it can accept mono or stereo inputs and generate mono or stereo outputs. Note that the jacks are quite closely spaced, so plugging in two inputs or two outputs might be a tight fit with some fatter plugs — so pancake jacks are out, other than for mono use. The Mimiq’s control system is extremely simple with a switch that lets you select how many synthetic ‘overdubs’ to add. Used in stereo into two amps, the added voices are spread across the stereo field for an impressively wide sound. Position 1 puts the dry guitar on one side and the doubled guitar on the other. In position 2 the dry guitar goes in the middle with a different doubled voice either side. Position 3 puts two doubled voices on one side and the dry plus the third doubled voice on the other. In mono-output mode, the dry and effected signal are summed according to the level control settings. The Tightness control regulates how different the doubled sounds are from the original, both in timing and pitch, though the added voices all have slightly different timings and pitch variances that shift in a subtle and organic way. At maximum tightness the added voices follow the original fairly closely, but there’s enough range to get quite sloppy if you feel the need. Somewhere in the middle, the magic occurs. Other than that there are separate level controls for the dry and wet sounds, and that’s it. The Mimiq works best placed post any distortion devices — unless you are after a specifically unnatural, dirtier outcome. The sound has a subtle flange-like element to it, as is natural when any two instruments are playing at very nearly the same time and same pitch, but this changes from note to note, just as it would in a real performance. At maximum ‘sloppiness’ where the Tightness control is fully clockwise, there’s a ‘slap-back’ quality to the doubled sounds but the result is still musically usable. As perhaps befits TC’s geographical origins, the pedal seems to give the best results on aggressive riff-based rock music, but it can also be used to thicken less dirty-sounding parts too. With all three voices going, the sound is very dense, which really helps to beef up the archetypal death-metal sound, whereas a single voice may be enough for more genteel styles. While two spaced amps give a most impressive stereo result, the effect also works perfectly well in mono, and though some purists may argue that it doesn’t sound exactly like two or more guitars playing the same part at the same time, it’s probably as close as you are likely to get in a compact pedal.